First off, Steph is holding a fabulous contest over at Reviewer X this week. Enter to win a complete set of Diana Peterfreund's Ivy League Novels. That's right--all four of them! So if you haven't yet, now is definitely the time to jump into that series. I've made no secret of what a fan I am. You can read me go on about them here, here, here, and over here. Leave Steph a comment and you're entered. Contest runs through next Wednesday. Go check it out. And in the spirit of matched sets, The Epic Rat (love the name) is giving away a set of all three of Lisa Shearin's Raine Benares books. I've reviewed all three books (here, here, and here) and they really are a hoot. The giveaway ends April 28th so head on over and leave a comment! Next, I've been the happy recipient of a few awards over the past couple weeks and I wanted to make sure to thank the lovely bloggers who passed on the bloggy love. Kimberly of Darque Reviews passed on the Let's Be Friends Award. The Let's be Friends Awards stands for this: These blogs are exceedingly charming. These kind bloggers aim to find and be friends. They are not interested in self-aggrandizement. 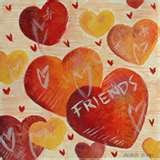 Our hope is that when the ribbons of these prizes are cut, even more friendships are propagated. Please give more attention to these writers. Thanks so much, Kimberly! It's not every day you get dubbed "exceedingly charming" and I treasure every blogging friend I've made. I'm going to pass this one on to a relatively new blog I've run across that I find delightfully charming: Young Adult Romance Reviews. Reviewer Ana pays specific attention to the romantic relationships in YA novels and her rating system is both thorough and quirky, including such factors as Overall Chemistry, The Bases, and Likelihood of an Eventual HEA. Love it. 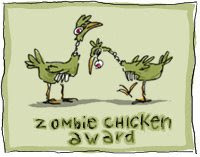 Jackie of Literary Escapism gave me the much-coveted Zombie Chicken Award. LOL. Far be it from me to bring down the wrath of the zombie chickens. Fortunately it's a no-brainer coming up with five rave-worthy bloggers. You're good people. I'm glad I know you. and can I just say again how much I love the new layout? Seriously, though, thanks! I love doing those "reviews that..." posts, although I should really spend more time reading the books, instead of writing about them. Ana, yay! I was nervous about redoing it and so happy with how it turned out. Jen, you are welcome! And I know what you mean. But I do love a well-written review and you find some great ones. KMont, I hear ya. Where does all the time go? p.s. My 4th grader came home today and told me she traded in the book she was reading for a different one and came home with Little Women! It is the short version, but still... she's making me look bad.